A study of 2,872 pairs of Danish twins concluded that only about 25 percent of life expectancy is attributable to genetics; the other 75 percent is likely due to lifestyle factors. (1) Twenty years after this was published in 1996, a study sponsored by National Geographic identified five places in the world where, per capita, people reach 100 years old 10 times more frequently than they do in the United States. (2) A team of researchers visited those five places to investigate what lifestyle factors might explain this remarkable longevity; while there, they interviewed 263 centenarians. They found these common factors: leading an active lifestyle, applying mechanisms for lowering stress, having a sense of purpose and belonging to the right tribe (a group of people who share similar interests). In addition to the factors that are common among the world's oldest residents, many other factors might add a few years to our life expectancy. For example, in 2013 the American Heart Association published a statement that concluded owning a dog probably decreases the risk of cardiovascular disease.3 All this research made us wonder how recreational scuba diving affects life expectancy. We asked the experts. Diving burns more calories than many people think. It is a very gentle form of exercise, but it is exercise nonetheless. Given that the diving population is aging steadily, do you think this type of cardiovascular exercise might be beneficial for divers, on average, or could the added cardiovascular stress be potentially harmful? Ingrid Eftedal, Ph.D.: Diving is associated with environmental factors that affect the cardiovascular system, and as long as the total amount of physiological stress is limited and the diver is reasonably fit, no data indicate that diving is harmful to the cardiovascular system. In addition to the health-promoting effects of exercise, one may speculate that diving could have additional benefits for the heart. It has been known for some time that breathing high amounts of oxygen activates an important type of proteins known as molecular chaperones (for historical reasons they are sometimes called heat shock proteins). Some of these molecular chaperones directly protect the heart from injury; extra oxygen is sometimes administered to patients before heart surgery for this reason. Dawn Kernagis, Ph.D.: Scuba diving can be a fantastic way to burn calories, with a recreational dive burning an estimated 300 to 600 calories per hour depending on temperature and activity level. Although most recreational diving can be very relaxing while still involving increased activity and low levels of joint stress, which is beneficial to individual health, some forms of diving can be strenuous and could put an individual with predisposing conditions at potential risk of injury or incident. It's important to remember that physical fitness is a major factor in determining potential risk with any form of increased physical activity, so risk associated with increased activity will largely depend on a diver's overall physical condition. When divers breathe air or nitrox at depth, reactive oxygen species are produced. Otherwise known as free radicals, these molecules have been found to be negatively associated with diseases and aging. On the other hand, regular exposure to low levels of oxidative stress might lead to immune responses that are similar to acclimatization. Do you think exposing ourselves to oxidative stress builds resilience in divers or has undesirable consequences? Kernagis: As with most biological systems, there is an optimal balance with respect to the degree of oxidative stress we are exposed to. Scuba diving can lead to a state of increased oxidative stress in which increased production of free radicals occurs not only due to increased physical activity but also due to the changes in the environmental conditions underwater (e.g., exposure to heat or cold, breathing high-pressure oxygen, being in a high-pressure environment). The combined influence of these diving-related factors on free radical production and the long-term effects on diver resilience and health have yet to be studied in depth but will be important in future research. Eftedal: Environmentally imposed stress — oxidative stress in particular — is a hot topic in research. Oxidative stress is a double-edged sword. Current knowledge indicates that our cells need a certain quantity of free radicals for biological signal transduction. When the production of free radicals exceeds the body's antioxidant capacity, however, the radicals may harm cell membranes, proteins and DNA, advancing cell aging processes and potentially causing gene mutations that may lead to diseases such as cancer. There is a vital balance, and the immune system appears to be involved in maintaining it. Still, there is nothing to indicate that safe diving destroys the balance between good and bad oxidative stress. Compared with nondivers who are the same age, same gender and live in the same state, divers are thought to be just as likely to have high blood pressure and/or high cholesterol but less likely to smoke or be obese. 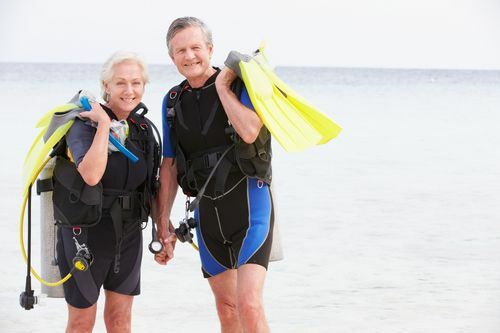 Having children is known to increase life expectancy (maybe because the kids can look after their aging parents), but active divers are thought to be 25 percent less likely to have children. On the other hand, divers are much more likely than nondivers to visit a doctor each year. With regard to these lifestyle factors, how do you think divers might fare in the long run compared with nondivers? Eftedal: I believe that healthy lifestyle choices, careful diving among them, are likely to lead to lower frequency of disease in the long run. Choosing activities you enjoy makes life more interesting, whether or not it is longer. Kernagis: The factors listed previously, in addition to numerous additional factors — including alcohol consumption, sleep quality, environmental exposures, fitness and nutrition — will have varying impacts on long-term health and wellness. Genetics will also play a role in how these factors interplay and ultimately affect a diver's health. Generalizing about nondivers versus divers is difficult. An individual who doesn't dive might be active in another way that has positive influential factors on his or her overall lifestyle. A healthy diver who is relatively active, doesn't smoke and follows a balanced diet, however, will have lower risks for certain diseases and injuries that could decrease quality of life or overall lifespan for others. Compared with the rest of the population, divers are traditionally thought to have, on average, higher levels of education and higher incomes. This might translate into better nutrition, safer cars and fewer poor health decisions. On the other hand, it might mean faster cars and greater indulgence. How likely is it that better education and higher earnings over the lifespan might affect longevity? Kernagis: Previous research has frequently pointed to a correlation between increased lifespans and improved education or higher income. A recent study emphasized that, between these two factors, higher education is a better predictor of longer lifespan.4 The study determined that more education can lead to improved cognitive abilities, which lead to better choices for health- and wellness-driving behaviors. The link between health and income is likely due to the influence of education status on earnings: Better education is often correlated with a higher income. Eftedal: To my knowledge, better education is a predictor of higher life expectancy on its own. From there, it becomes hard to discern factors on the levels of causation versus association (e.g., higher earnings tend to follow education). One additional factor — improved gender balance with women moving into traditionally male-dominated fields — may make a positive difference for risk management. Some recreational dives may produce bubbles that cause no symptoms, and bubbles have been linked to endothelial damage (damage to the lining of our blood vessels). Could bubbles be good for us by cleaning plaque out of our blood vessels or regularly renewing the lining? Or are they probably all bad news for divers? Eftedal: Intravascular bubbles are interesting; they appear so frequently in diving yet only occasionally cause injury or disease. I am not convinced that bubbles have anatomy on their side for acting as pipe cleaners though. Vascular damage, including atherosclerotic plaque, typically occurs in arteries, whereas decompression-induced bubbles are usually found in veins, where the blood pressure is lower. What we observe will always depend on the tools we use, however, and when it comes to bubbles I am sure there is much left to explore — good and bad. Kernagis: While numerous studies have demonstrated transient endothelial dysfunction because of vascular bubbles, we have not extensively studied potential beneficial effects of bubbles passing through our blood vessels. When subjected to environmental stresses, humans respond through genetic up or down regulation. Is it possible that regular divers have greater resilience to other environmental stresses because they dive? What about greater resistance to diseases such as cancer? Kernagis: Diving exposures, in addition to other exposures such as exercise, can precondition individuals for protection in subsequent dives. It has been suggested that this preconditioning could also increase resilience in other environmental extremes, such as hypoxia or environmental stressors that affect the immune system, but more studies need to be conducted to fully assess this potential effect of diving. Eftedal: Yes, there are genetic data that indicate that regular divers may develop resilience. Along with Croatian researchers, we compared experienced technical divers to nondivers a few years ago. We found that the divers had specific genetic activity changes in their blood cells compared with the nondivers and that these changes might counteract negative effects of oxidative stress. Although diving may promote resilience on a basal biological level, however, we cannot say whether this affects cancer risk. Published data on cancer mainly concerns professional divers who may also have been exposed to chemical pollutants at work, which puts them in a different category than sport and recreational divers. Recent research suggests that recreational diving is relatively safe, with around two deaths per million scuba dives.5 Despite that, drowning is the most common cause of death in recreational diving. How might a relatively small risk of accidental drowning affect the average life expectancy of divers? Eftedal: Although drowning is a risk not to be taken lightly, I believe that the health benefits of physical exercise in general, including diving, are more likely to affect life expectancy of divers as a group. Kernagis: Given the extremely low mortality rate in recreational diving, I don't believe the risk of accidental drowning will have a significant impact on the average life expectancy of divers overall. Divers can minimize their risk of accidental drowning or other types of dive accidents even further, however, by following safe diving practices. Finally, if we were to conduct a twins study and follow thousands of pairs of twins where one twin scuba dives and the other does not, do you think we might see a difference in life expectancy? Eftedal: This would be a dream design for research: the perfectly controlled study. If I were to gamble, my bet would be that even with the risks involved in diving, you would find a higher number of centenarians among the diving twins because of acquired acclimatization against environmentally imposed stress. Kernagis: To truly assess the impact of diving on life expectancy, each pair of twins would need to live an otherwise equivalent lifestyle. Factors that are known influences on longevity such as nutrition, physical activity, environmental exposure and psychological stress would have to be the same for both twins from birth. 1. Herskind AM, McGue M, Holm NV, Sorensen TI, Harvald B, Vaupel JW. The heritability of human longevity: a population-based study of 2872 Danish twin pairs born 1870-1900. Human Genetics 1996; 97(3):319-23. 2. Buettner D, Skemp S. Blue Zones: Lessons from the world's longest lived. American Journal of Lifestyle Medicine. 2016; 10(5):318-21. 3. Levine GN, Allen K, Braun LT, Christian HE, Friedmann E, Taubert KA, et al. Pet ownership and cardiovascular risk: a scientific statement from the American Heart Association. Circulation 2013 June 11; 127(23):2353-63. 4. Lutz W, Kebede E. Education and health: redrawing the Preston curve. Population and Development Review 2018; 44(2):343-61. 5. Buzzacott P, Schiller D, Crain J, Denoble PJ. Epidemiology of morbidity and mortality in US and Canadian recreational scuba diving. Public Health 2018; 155:62-68. Ingrid Eftedal, Ph.D., is a researcher and project manager in the Department of Circulation and Medical Imaging at the Norwegian University of Science and Technology (NTNU) in Trondheim, Norway. She is a civil engineer with expertise in biophysics and medical technology; her Ph.D. is in molecular biology. Eftedal's work focuses on how the body reacts and acclimatizes to the diving environment. Dawn Kernagis, Ph.D., is a research scientist at the Florida Institute for Human and Machine Cognition, where she specializes in human performance optimization and risk mitigation. She has a biochemistry degree from North Carolina State University and a Ph.D. from Duke University, where she studied gene array-based diagnostic development in the settings of undersea medicine and cancer.